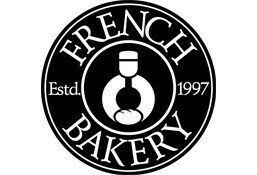 French Bakery is currently closed for delivery and it will open at 09:00 AM today . Pizza (Medium) + Pastry + Evian Water / Soft Drink. Served With Toasted Bread & Emmental Cheese. French lentil du puy soup served with toasted bread. Homemade Chunky Meat Sauce,Topped With Parmesan Cheese. Chicken & Mushroom Creamy Sauce,Topped With Fresh Chopped Parsley. Tomato Sauce, Chicken Breast, Marinated Mushroom, Mozarella. Tomato Sauce, Turkey Ham, Grilled Chicken Breast, Capsicum, Fresh Pineapple, Mozarella. Tomato Sauce, Tuna, Onion Rings,Mozzarella. Tomato Sauce, Artichokes, Green Peppers, Mushrooms, Corn, Olives & Mozzarella. Baguette Bread,Smoked Turkey,Emmental Cheese,Lolo Rosso Lettuce,Pommery Mustard Mayonnaise. Multi Grain Bagel,Veg Omelet With Emmental Cheese,Turkey Rashers,Butter. Bloomer Bread,Roasted Chicken,Turkey,Omelet,Emmental Cheese,Pesto Mayonnaise,Portobello Mushroom,Tomatoes,Fraisie Lettuce,Assorted Peppers. Tandoori Chicken,Mint Yoghurt,Fried Onions,Cucumber,Tortilla Wrap. Granary Bread,Roasted Chicken,Emmental Cheese,Red Capsicum,Lolo Rosso Lettuce,Mayonnaise. Herbs Bread,Mozzarella Cheese,Sundried Tomato,Pesto Mayonnaise,Basil Leaves. Banana, Strawberry, Vanilla Ice Cream, Milk & Cream. Orange, Pineapple, Peach & Grenadine Syrup. Fresh Mint, Lemon Juice & Lime Syrup. Pineapple, Mango & Blue Curacao Syrup. Orange, Pineapple, Lemon, Grenadine Syrup. Caramel Flavoured Espresso, Cold Milk, Whipped Cream, Caramel Sauce & Crushed Nuts. Chocolate Flavoured Espresso, Cold Milk, Whipped Cream & Chocolate Sauce. Espresso, Cold Milk, Sugar Syrup. Chocolate Syrup, Cold Milk Whipped Cream & Dusted Chocolate.